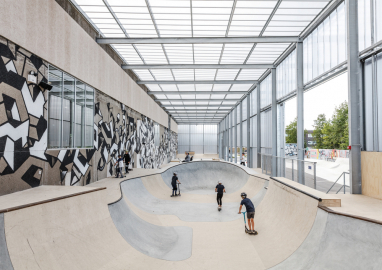 Streetmekka is a renovation project that transformed an abandoned windmill factory into a vibrant hub for street sports and street culture, offering various facilities for self-organized sports and social spaces for the local youth of Viborg in Denmark. 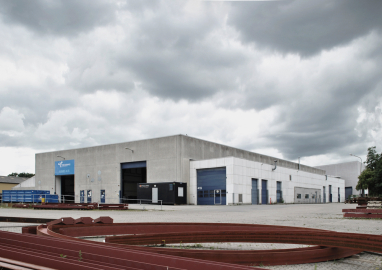 Located in the outskirts of Viborg, the original building was a typical example of the many mass-produced warehouses from the '70s found in many suburban industrial areas of the world. 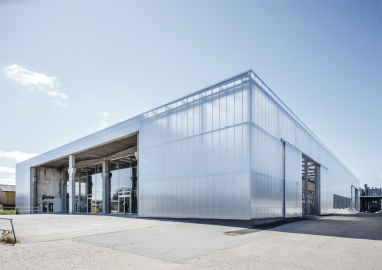 The transformation opens up the introverted building and transforms the impressive factory space into a new interior: A covered streetscape opening up to the outside. 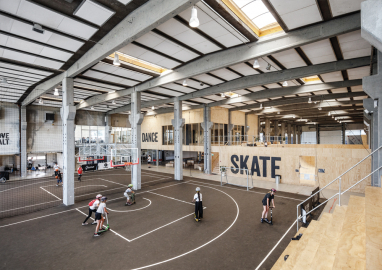 The project revives the building offering various sports facilities like parkour, skate, bouldering, basketball, trial as well workshops for music, art, wood and metal, DJ, an animation studio, fab lab. 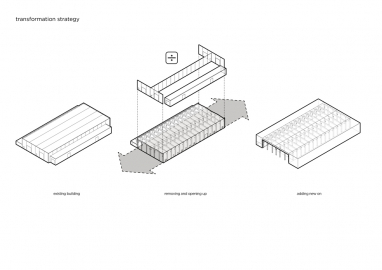 Social spaces are distributed and strategically interwoven in-between the activities, based on the notion that proximity fosters participation. The landscape becomes the natural extension of the indoor with sports and cultural functions placed in a future green pedestrian and bicycle path leading to the city. 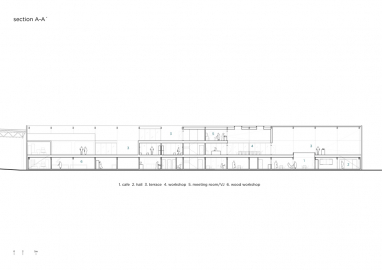 The original building was perceived as having little historic, cultural and architectural value. Instead of demolition, the focus of the project was on how to take this introverted building and transform it with a very limited budget? 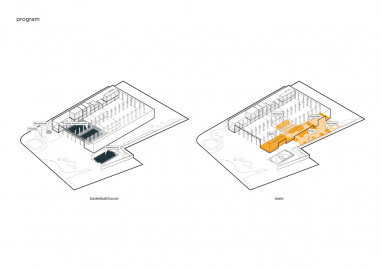 Despite the generic appearance, these typologies often contain an impressive interior space and the idea was to expose it to the outside world. 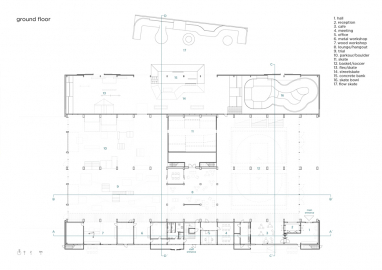 By removing the walls at both ends of the building and placing all the office and workshop spaces on one side and the skating on the other, the interiors are kept as free as possible. The existing concrete facade is wrapped in a new translucent skin that gives the appearance of a light and welcoming building, changing from day to night. Last, the building is filled with functions aimed to meet the increasing demand for self-organized alternatives to the established sports and cultural activities, supporting the client mission to attract local youth and create lasting social change through sports and culture, enabling integration and empowerment in their lives. 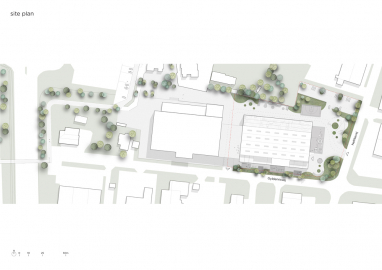 With many vacated industrial sites being incorporated in the urban expansion, this approach has the potential to be scaled and replicated. 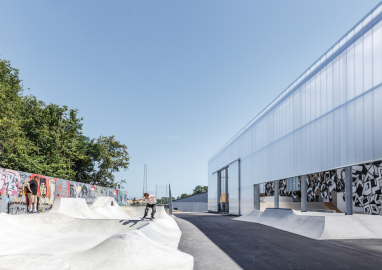 With the aim of opening up the introverted building and adding daylight without losing the industrial atmosphere, the polycarbonate was chosen for the façade, due to its durability and robustness, which make it an apt material to withstand the use as a sports center. 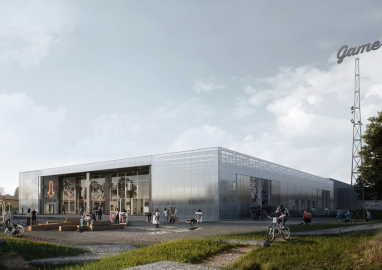 The translucent skin serves as a giant canvas for local visual artists to display and project their art but also clearly differentiates the building from the surrounding industrial facilities, being the first lot to be transformed in the new neighborhood that works as a catalyst for city life in the upcoming area. 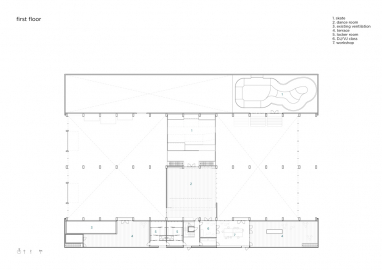 The indoor space is sustainably arranged according to defined temperature zones related to the activity: meeting room and workshops are enclosed in separate heated volumes whereas the active sports take place in the main volume at 15°. The preservation of the original structure and the reuse and upcycling of materials made it possible to carry out the refurbishment at a very low expense. Many of the original components were also repurposed as furniture elements for the parkour activities and hang-out spaces. 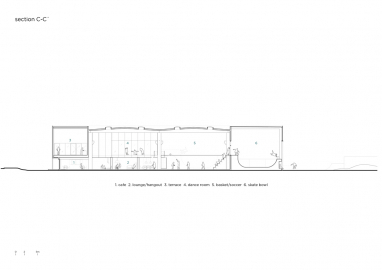 The final cost of the building is approximately one-third of a traditional sports hall.